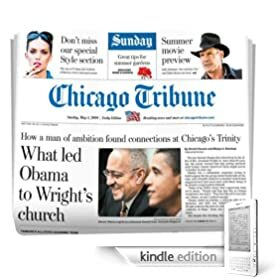 It was announced today on the official Amazon Kindle blog that the Chicago Tribune will be available in the Kindle newspapers section for download. This brings the total number of newspapers on the Kindle to 21 and as always there is a free 14-day free trial. With the Chicago Tribune, you’ll have everything you need to stay informed. Whether it’s Chicagoland, national or world news–the Chicago Tribune has it all. The Chicago Tribune’s Pulitzer-Prize winning journalists provide all of the coverage and features you need to start your day off right. The Kindle Edition of The Chicago Tribune contains articles found in the print edition, but will not include some images and tables. Also, some features and sections such as Chicago Tribune Magazine, the crossword puzzle, Parade magazine, box scores and classifieds are not currently available. For your convenience, issues are automatically delivered wirelessly to your Kindle so you can read them each morning. This entry was posted in Kindle Newspapers and tagged Chicago Tribune, Kindle Newspapers, New Newspapers, Newspapers by Dzmitry. Bookmark the permalink.